« Are the Cartesio Journals and Planners Fountain Pen Friendly? I have been experimenting with a few illustrations done with Prismacolor Colored Pencils and I noticed that different paper yields slightly different results. The differences are most apparent in smooth blended areas of color, but there were a few other differences as well I thought worth noting. 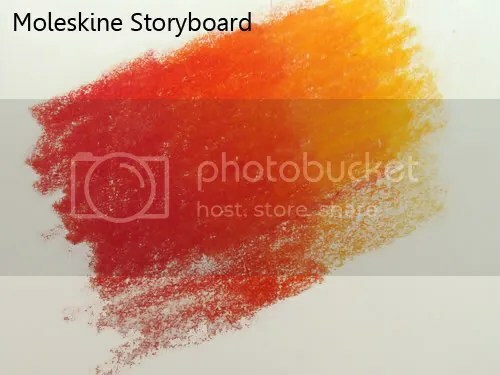 Color blends were created in a Moleskine Storyboard Notebook, Plain Notebook and Ciak Sketchbook. The top of each blend was creating using heavy coverage and lots of pressure, while the bottom portion of the blends were created using light pressure. 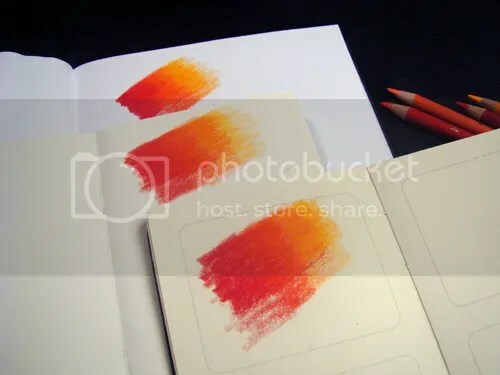 I used four Prismacolor colored pencils in the red-orange tonal range to simulate a color blend you might have when illustrating things from nature such as berries or flowers. The notebooks I tested were the Moleskine Storyboard Notebook, Moleskine Plain Notebook and the Ciak Sketchbook. On each blend, I drew with lots of pressure at the top of the blend and with very little pressure at the bottom. I wanted to see how blends using different pressure would look. Four colors were used to simulate a color blend you might find in nature. The Moleskine paper in both journals was ivory in color and the Ciak Sketchbook was nearly white. The paper in the Moleskine Storyboard was the thickest, with the Ciak Sketchbook just slightly thinner. The Moleskine Plain notebook had the thinnest paper. Note: that the paper in the Storyboard Notebook appears to be the same as the paper in the Moleskine Sketchbook so I would expect similar results with Moleskine’s Sketchbook. After creating the blends in each journal, the first difference I noticed was the color. The whiter, brighter Ciak paper yielded more intense color that overall appeared cleaner than the paper in either Moleskine notebook. I am assuming that the ivory color of the paper was the primary reason, but the Moleskine Plain notebook appeared the dullest of all. This really isn’t a problem because the Plain notebook is more of a writing tool than a sketchbook. The color is still good enough for most uses. The next thing I noticed was the look of the blends. The paper in both Moleskine journals is coated, so the blends created with lots of pressure did not go down as nicely as the blends on the Ciak Sketchbook. 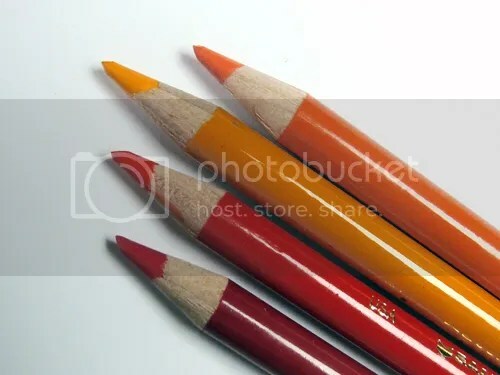 Because the paper is smooth, the wax of the pencils tended to bunch up on the edges or where the colors overlapped and I even had a small amount of color flaking in the Storyboard Notebook in the densest areas of color. In the lighter portions of the blended areas, the difference was not so pronounced, but I did prefer the paper of the Ciak Sketchbook and Moleskine Plain notebook because both papers have a little bit of tooth for smoother, more consistent transitions. 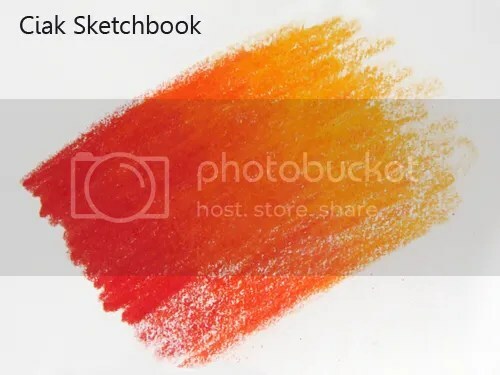 Note: Be careful when using lots of pressure with your colored pencils in the Moleskine Storyboard Notebook or Sketchbook. The strokes I drew with the most pressure actually developed a shine or a burnished look. This could be interesting as an artistic touch when done intentionally, but it wreaks havoc with smooths transitions. The paper in the Ciak Sketchbook is bright white and has a little bit of tooth to it. I found I preferred it for smooth blends using the colored pencils. The colors appeared the brightest and the waxy pencils performed in a more predictable manner. The ivory paper of the Moleskine Storyboard Notebook is thick, smooth and has a coating on the surface. While this is great for pens and even graphite, the slick surface is not ideal for waxy colored pencils. Areas of heavy coverage had a tendency to bunch up and even flaked a bit where the color overlapped. Edges where color faded completely tended to be coarser than those on the Ciak. The coating on the paper creates tiny, pale specks on the paper leaving areas where the pencil did not cover well, similar to the issue I had with the Moleskine Sketchbook in another review. These are hard to see in the photos but appear as tiny white pinholes in the color. 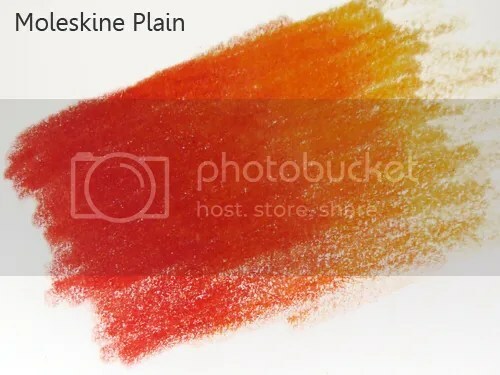 The Moleskine Plain notebook resulted in the dullest color, but I preferred the texture of the colored pencil blends to those done in the Moleskine Storyboard Notebook because the paper has a slight tooth to it. The same pale specks appeared on this paper that were evident on the Moleskine Storyboard Notebook, but overall they are not too distracting. While any of these journals are great for general sketching, I preferred the Ciak Sketchbook for using with colored pencils. The blends are smoother and it was easier to achieve more natural looking transitions. The paper is similar to what you would find in a traditional sketchpad and the paper is brighter, giving you cleaner, more accurate color. try using Borden & Riley 100S Comp Marker Pad . Thank you for your suggestion. Can you tell me a little more about the Borden & Riley Marker Pad and your experiences with it?